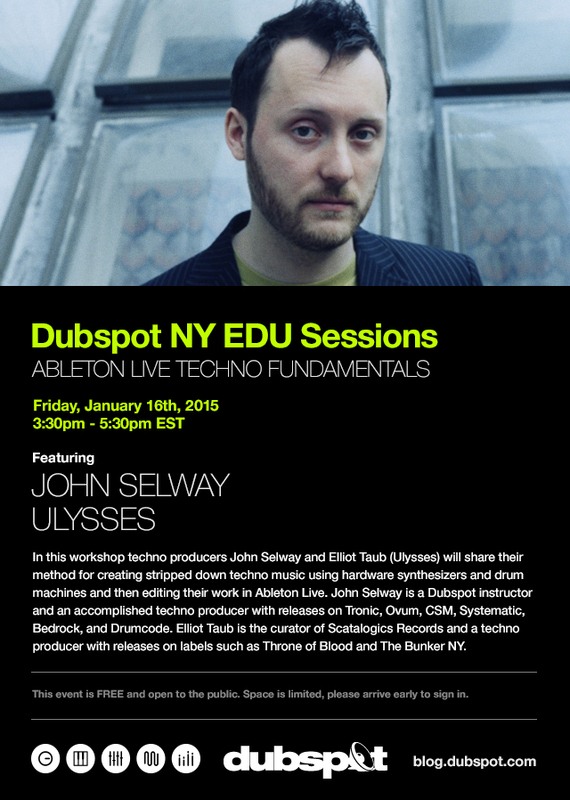 On Friday January 16th, Dubspot NY hosted a special Ableton Live workshop featuring techno producer and Dubspot Instructor John Selway, alongside special guest, Elliot Taub aka Ulysses. Interested in taking Music Production with Ableton Live at Dubspot? We have classes starting on in NYC, LA, and online. Register now! In this workshop techno producers John Selway and Elliot Taub (Ulysses) will share their method for creating stripped down techno music using hardware synthesizers and drum machines and then editing their work in Ableton Live. John Selway is a Dubspot instructor and an accomplished techno producer with releases on Tronic, Ovum, CSM, Systematic, Bedrock, and Drumcode. Elliot Taub is the curator of Scatalogics Records and a techno producer with releases on labels such as Throne of Blood and The Bunker NY. Looking to learn some more? We recommend you watch John Selway’s Techno Fundamentals tutorials. In the series, Selway explores basic techno composition techniques and unorthodox production methods.